FM’19 will take place at the Alfandega Porto Congress Centre (APCC) (Google Maps: 41.143928, -8.621688) in Porto, by the river Douro. 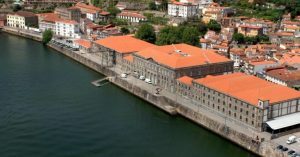 This is the old building of the warehouse and customs house of Porto which has been since subject to many amplification and reconstruction projects. The current building was finished in 1869 and was operational until 1987. Later converted into a Museum of Transportation, in 1992 it was renovated by the architect Souto Moura to become a modern 36000 m2 conference center with 22 multifunctional spaces and a 400 parking space.